I wish that, with my Venezuelan background, I can say that this recipe is my mother’s traditional recipe or perhaps a culinary family heirloom. The fact of the matter is that I’ve never seen at ate a Tres Leches Cake made by my mom. Somehow, I did develop a slight obsession with this delicious sweet cake. 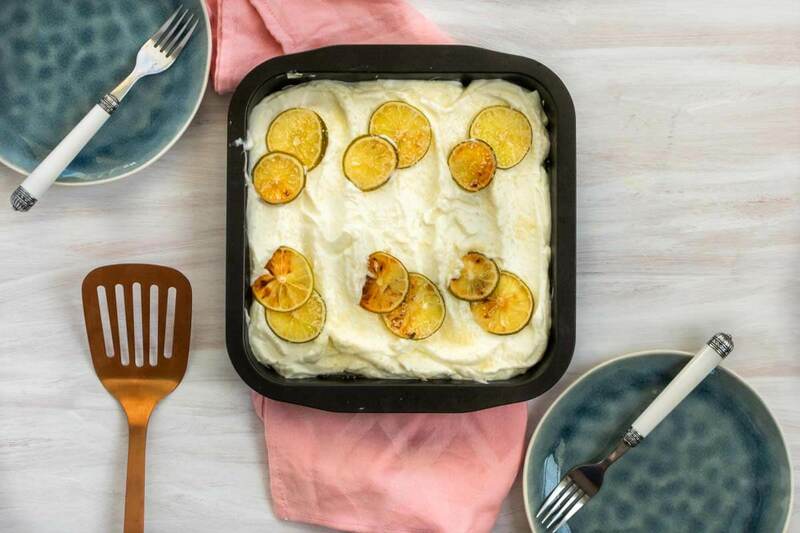 It might be because of the uncomplicated character of this cake or the fact that I have yet to find someone who doesn’t like a good Tres Leches Cake. 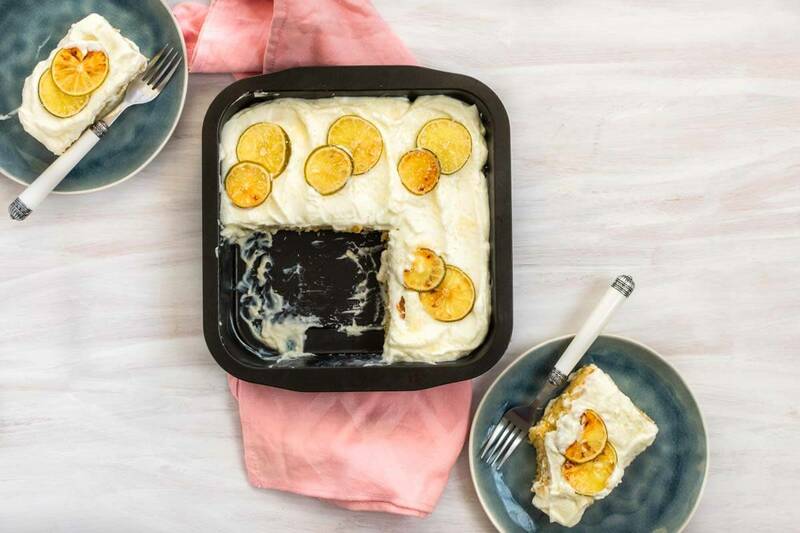 Whatever reasoning, Tres Leches Cake is life! In the past, I posted a “traditional” recipe of the Tres Leches Cake, but this time I wanted to try something a little bit more out of the box. 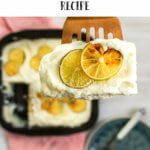 By playing with some recipes, I created this Coconut Lime Tres Leches Cake recipe. I can’t take all the credit though, because like mentioned this Tres Leches Cake is a combination of a few recipes. The base of the recipe is from the legend herself, Martha Stewart, while the idea for the lime and coconut infusion comes from fellow food blogger—Now, Forager. The recipe is pretty straightforward. The cake base is much the same as a normal cake. The only difference is the addition of lime zest and coconut flakes into the cake mixture. 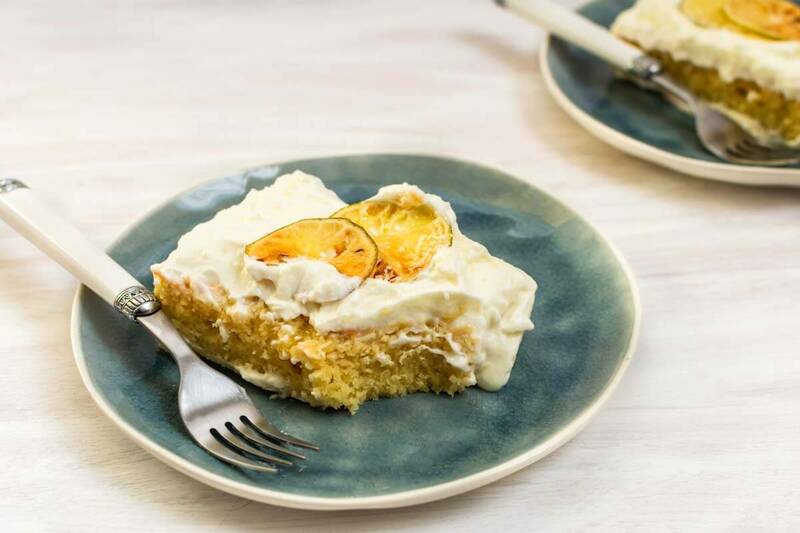 However, the fundamental part of any Tres Leches Cake Recipe is the addition of the milk blend, consisting of 3 different kinds of milk. Hence the name tres leches! 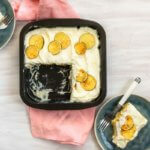 For this Coconut Lime Tres Leches Cake recipe, I swapped one of the milk types for coconut milk. I also added lime juice to the mixture. The coconut and lime break the sweetness of the cake, by bringing a tart flavor to this traditional Latin-American cake. To let the cake soak in all the milk thoroughly, poke a lot of holes in the cake. When you think you poked enough, poke some more. After pouring the milk blend onto the cake let it rest for at least 2-3 hours, so it gets time to soak in all that milk goodness. Originally, I was thinking of adding dried limes to the cake as a garnish. Then I came across ‘Now, Forager‘ recipe and I immediately thought of trying it out. While you can eat it, the lime taste is still pretty strong. Now, my limes are slightly over baked and not perfect. I kept feeling like they weren’t really dried and then they started becoming brown. As you can see, I still have a long way into becoming a modern-day Martha Stewart. I bet I’m more fun than her, though. Even if you think they’re not done take them out and place them on a plate covered with paper towel. They will dry further on the plate. Tres leches cakes are often made with Italian meringue, but I wanted something different for my Coconut Lime Tres Leches Cake recipe. Well, to be honest making Italian meringue sounded too complicated and intimidating. So, I decided to go for a whipped cream topping and I truly believe this was the better choice. While whipped cream is sweet, it is not as sweet as an Italian meringue. With all the sweetness they recipe already has, I didn’t want to add more sweetness to it. Plus, nobody got time for a perfect Italian meringue. 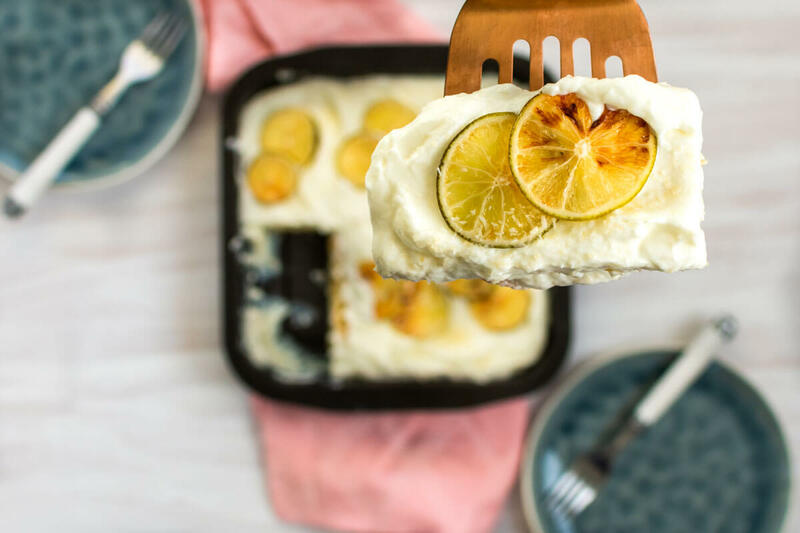 Coconut lime tres leches cake recipe with lime and coconut infused milk blend, whipped cream, and garnished with candied limes. Cut the lime into very thin slices using a sharp knife or mandoline slicer. In a small saucepan add the sugar and water and bring to a boil. Cook until the sugar has dissolved. 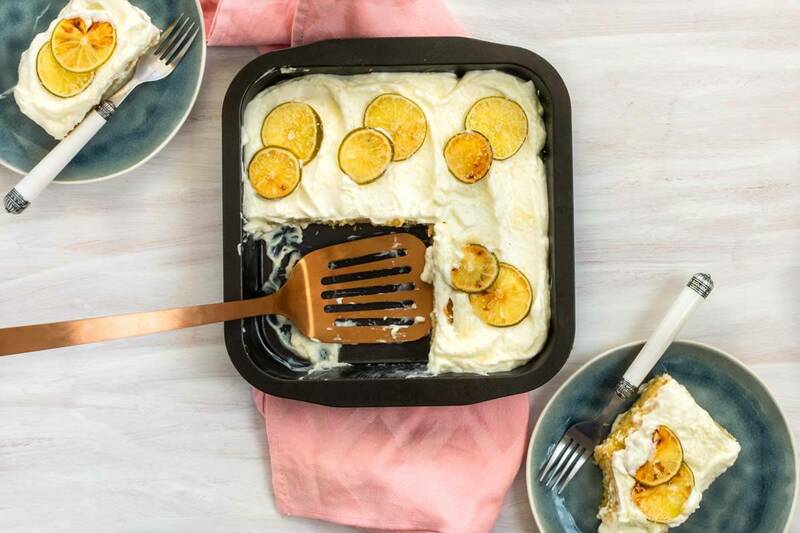 Pour the simple syrup in a heatproof baking dish. Add the lime slices and let them soak overnight. Grease your tin with unsalted butter. In a bowl mix together the flour, baking powder, and salt. In another bowl, using an electric mixer, beat the eggs and 3/4 cup sugar on high until pale and thick. Add the vanilla and combine. Lower the mixer speed and gradually add the flour mixture and beat to combine. Fold the melted butter until well incorporated. Pour batter into baking dish and bake until golden brown and a toothpick inserted in the center comes out clean (about 20 minutes). Lower the oven to 200F when done. In a small bowl, whisk together the coconut milk, condensed milk, and 1 cup heavy cream. Poke the cake with a wooden skewer all over then pour the milk slowly over the top. Cover and let it sit for at least 2 hours. In the meantime, add the limes into the oven and bake them for around 10-15 minutes until they start getting dry. Afterward, remove from oven and place on a plate covered with paper towel. Let them sit so they further dry up. Before serving beat 1 cup of heavy cream with 1/4 cup sugar until stiff. Fold 1 cup of coconut flakes to the whipping cream. With a rubber spatula add the whipped cream in strokes on top of the cake. Garnish with candied limes and sprinkle extra coconut flakes on top.